Note: The Legislature’s leaders are marked with an asterisk (*) before their name. The official list of Assembly members can be found here; of Senate members here. An Assembly list with party ID can be found here. It is remarkable when any state legislator comes out in public opposition to calling a state constitutional convention. As a general rule, legislators prefer to keep their position private while working behind the scenes to oppose a yes vote. Vivid examples of this type of passive-aggressive legislative behavior was seen in Rhode Island in 2014 (see RhodeIslandConCon.info). Gianaris, Michael (D-Queens). Source: Silberstein, Rachel, As Con Con Debate Heats Up, Heastie Declares Opposition, Gotham Gazette, February 22, 2017. Krueger, Liz. Source: Feiden, Douglas, Contesting the ‘Con-Con’, Our Town, October 17, 2017. Alcantara, Marisol (D-Manhattan). Source: Unions and Independent Democratic Conference members stand together against national right-to-work legislation and release four-point protection plan for New York State workers, press release from office of Senator Jeff klein, February 10, 2017. See also the accompanying report, Union Strong. Carlucci, David. Source: Local Officials Oppose NYS Constitutional Convention (audio), WRCR.com, August 9, 2017. See also NYS Senator: I’m Opposed to Constitutional Convention, WRCR AM 1700, September 6, 2017. Fight Over Constitutional Convention Vote Ratchets Up, WRCR AM 1700, September 18, 2017. DeFrancisco, John. Source: Weiner, Mark, State Sen. John DeFrancisco opposes NY constitutional convention, Syracuse.com, October 19, 2017. Diaz, Ruben (D-Bronx). Source: Why I Am Against A Constitutional Convention, New York State Senate website, April 19, 2017. *John Flanagan (R, Suffolk, Majority Leader). Source: Silberstein, Rachel, As Con Con Debate Heats Up, Heastie Declares Opposition, Gotham Gazette, February 22, 2017; Reisman, Nick, ‘Con-Con’ a No-No, Say Legislative Leaders, Spectrum Daily News, May 12, 2017; Reisman, Nick, ‘Con-Con’ a No-No, Say Legislative Leaders, Spectrum Daily News, May 12, 2017. Hamilton, Jesse (D-Brooklyn). Source: Unions and Independent Democratic Conference members stand together against national right-to-work legislation and release four-point protection plan for New York State workers, press release from office of Senator Jeff Klein, February 10, 2017. See also the accompanying report, Union Strong. Hoylman, Brad (District 27). Source: The Constitutional Convention Question, Senator Brad Hoylman Fall 2017 Newsletter. *Klein, Jeff (D-Bronx, Independent Democratic Conference Leader). Source: Unions and Independent Democratic Conference members stand together against national right-to-work legislation and release four-point protection plan for New York State workers, press release from office of Senator Jeff Klein, February 10, 2017. See also the accompanying report, Union Strong, and Hughes, Kyle, State Senate members oppose constitutional convention, Saratogian Politics, May 2, 2017. Little, Betty (R-Queensbury). Source: Mahoney, Bill, Battle lines form over push to update New York’s Constitution, Union-Sun & Journal, May 20, 2017. Montgomery, Velmanette (D). Source: New York State residents have a lot to lose, press release and event notification, June 30, 2017. Ortt, Rob (R-Niagara County). Source: Mahoney, Bill, Battle lines form over push to update New York’s Constitution, Union-Sun & Journal, May 20, 2017. Peralta, Jose (D-Queens). Source: Unions and Independent Democratic Conference members stand together against national right-to-work legislation and release four-point protection plan for New York State workers, press release from office of Senator Jeff klein, February 10, 2017. See also the accompanying report, Union Strong. Savino, Diane (D-Long Island). Source: Reisman, Nick, Albany Takes A Wary View Of Con Con, State of Politics, June 30, 2017. Seward, Jim (R-Milford). Source: Mahoney, Bill, Battle lines form over push to update New York’s Constitution, Union-Sun & Journal, May 20, 2017. Stewart-Cousins, Andrea (D-Yonkers, Minority Leader). Source: Lovett, Kenneth, Democratic lawmaker warns against convention to change N.Y. constitution, New York Daily News, May 8, 2017. As of February 2017, she hadn’t taken a position. See Senator Andrea Stewart-Cousin (D; Minority Leader). Source: Silberstein, Rachel, As Con Con Debate Heats Up, Heastie Declares Opposition, Gotham Gazette, February 22, 2017. Tedisco, Jim (formerly an assemblyman) (R-49th District). Source: Griffith, Glenn, Candidates for 49th Senate District seat spar in lively debate, CNWeekly.com, Oct. 20, 2016. Valesky, David (D-Oneida). Source: Hughes, Kyle, State Senate members oppose constitutional convention, Saratogian Politics, May 2, 2017. Young, Cathy. Sources: Larson, Greg, Young and Goodell: State Constitutional Convention Right Now Could Be Devastating, Chautauqua Today, April 30, 2017; CSEA Leadership Opposes State Convention, The Post-Journal, August 21, 2017. See also Observer, August 16, 2017. Kolb, Brian (R-District 131, Canandaigua; Minority Leader). Source: Kolb, Brian, The case for a constitutional convention, Auburnpub.com, February 7, 2017. Fitzpatrick, Michael, (R-Smithtown). Source: Dobie, Michael, Dancing the con-con, Newsday, July 13, 2017. Barclay, William A (R-District 120). Source: Barclay, William A., Voters to Decide on Constitutional Convention in November, iHeart Oswego, July 14, 2017. Byrne, Kevin (R). 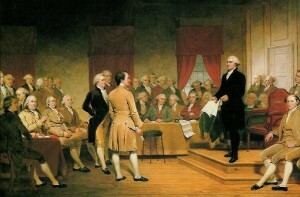 Source: Propper, David, Merits of Proposed Constitutional Convention Debated, The Examiner, August 14, 2017. Giglio, Joseph (R-Gowanda). Source: Miller, Rick, Local political, elected officials urge ‘no’ vote on Constitutional Convention, Olean Times Herald, October 15, 2017. Goodell, Andrew (R-Chautauqua). Sources: Larson, Greg, Young and Goodell: State Constitutional Convention Right Now Could Be Devastating, Chautauqua Today, April 30, 2017; CSEA Leadership Opposes State Convention, The Post-Journal, August 21, 2017. See also Observer, August 16, 2017. *Heastie, Carl (D-Bronx, Assembly Speaker). Source: Silberstein, Rachel, As Con Con Debate Heats Up, Heastie Declares Opposition, Gotham Gazette, February 22, 2017; Reisman, Nick, ‘Con-Con’ a No-No, Say Legislative Leaders, Spectrum Daily News, May 12, 2017. Jaffee, Ellen. Source: Local Officials Oppose NYS Constitutional Convention (audio), WRCR.com, August 9, 2017. Lifton, Barbara (D-District 125). Source: Assemblywoman Lifton speach against the Constitutional Convention, Central New York Area Labor Federation, AFL-CIO., September 27, 2017. Lupinacci, Chad (R-Huntington Station). Source: Beach, Connor, Pols, Local Groups: Vote ‘No’ On Constitutional Convention, Long-Islander News, October 19, 2017. Mosley, Walter T. (D-District 57). Source: New York State residents have a lot to lose, press release and event notification, June 30, 2017. Spencer, William “Doc” (D-Centerport). Source: Beach, Connor, Pols, Local Groups: Vote ‘No’ On Constitutional Convention, Long-Islander News, October 19, 2017. Stec, Dan (R-Essex, Saratoga, Warren, Washington). Source: Constitutional Convention Forum, Mountain Lake PBS, May 26, 2017. Assemblyman Robert Carrolll (D-Brooklyn). Source: Silberstein, Rachel, As Con Con Debate Heats Up, Heastie Declares Opposition, Gotham Gazette, February 22, 2017. Crouch, Clifford W. Source: Crouch, Clifford W., What Is The Constitutional Convention?, The Reporter, October 11, 2017. Assemblyman Brian Kavanagh (D-Manhattan). Source: Silberstein, Rachel, As Con Con Debate Heats Up, Heastie Declares Opposition, Gotham Gazette, February 22, 2017. Assemblyman Nicole Malliatakis (R-NYC). Malliatakis is running as a Republican for NYC mayor. Source: Malliatakis on ConCon. NewYorkTrue.com, May 5, 2017. Governor Andrew Cuomo. See home page of NewYorkConCon.info. Note: Cuomo is at best an ambivalent yes. He unequivocally ran for governor with a promise to support a constitutional convention call as a way to clean up Albany. And his dad, Mario Cuomo, after leaving the governor’s office, was an even stronger supporter. But his recent comments and actions have been decidedly more ambivalent. Source: Reisman, Nick, Albany Takes A Wary View Of Con Con, State of Politics, June 30, 2017. Comptroller Thomas DiNapoli. Source: Molongoski, Brian, DiNapoli, Watertown Daily News, June 8, 2017; Miller, Rick, DiNapoli encouraged at number of congressional Dem candidates, Olean Times Herald July 29, 2017.